A couple days ago, the first thing I did was look out the bedroom window to see if there were any ducklings out there. I had seen some the day before, but I was astonished to actually see them again, on the driveway, glowing and backlit from the morning sun! What a great way to start the day! You have to imagine the glowing. I’ll never get a photo of that. They live next door, to the south. I can see them from my deck, and from the window right next to my desk. I can hear the peeping, too! 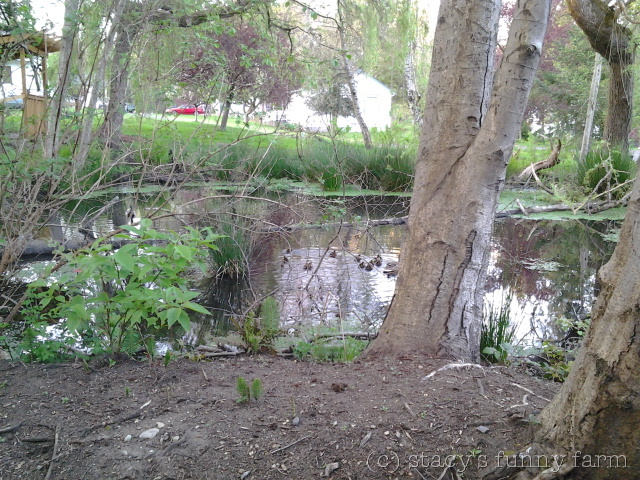 There is a little ball of ducklings in the very center of this photo. I’ve never actually seen ducklings in that little pond before this year. Maybe that’s because their cat is now gone. 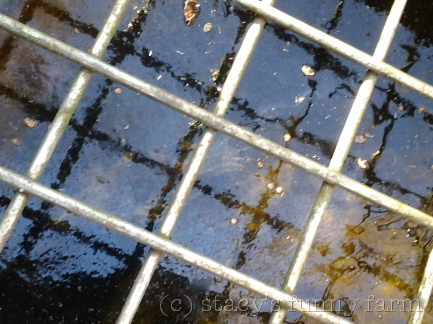 Dobby’s little stream drops into a culvert, goes under my driveway, and into the little pond. There is a hole under the fence where the culvert dumps out. There is a little slope at one side that ducklings can negotiate. They don’t have to jump. The ducklings hesitate at the drop-off at the edge. Sometimes they come over to play in my little waterfall and look for bugs in the quagmire next to my driveway. Heading around the fence this time. 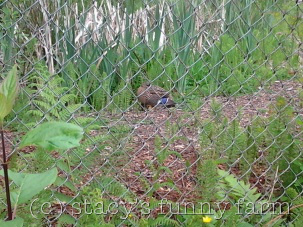 When I saw them glowing, they were leaving my duckling playground, heading home the long way around the fence. There is pretty good cover that direction, even though they have to go near the street. It’s a dead end with hardly any traffic. There are plenty of puddles to play in between here and there. I feed the mom all year long, so she doesn’t mind me following her around. We’re good friends. I have been tossing out cracked corn for her. The ducklings prefer bugs, but there’s not a whole lot I can do about that. They have trouble getting over that curb! Their little legs go pretty fast, but they aren’t so good at jumping! They’ll grow big enough to hop that curb by next week. The neighbors are helping to watch out for them, too. Ducklings in the pond next door to the NORTH, too! If that isn’t enough cuteness, there are ducklings on the big pond to my immediate north, too! I was seeing ducklings all the time there, and then I noticed that there were two moms, two broods! I’m tossing cracked corn over the fence that direction, too. 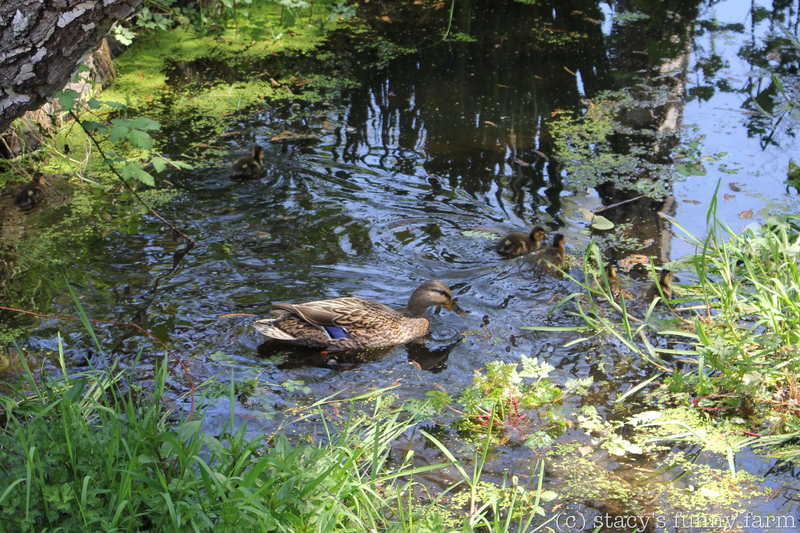 Ducklings on the north pond, viewed from my aviary. This is the view that my tomcats have. Kitty Hawk and Grover are pretty interested, so I won’t be letting them out at all for a while. 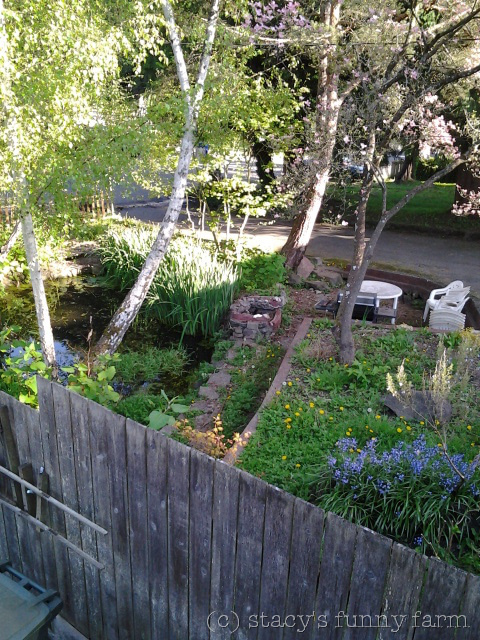 I relocated a wild turtle from the street to this pond last summer, but I haven’t seen him this spring. Sometimes they just look like this, under mama’s wings. In the video, you can see three dads to the far left, watching over a mom with babies. The property next door has nearly 10 acres of wetlands, so there could be more than two broods there. The daily dramas have taken me beyond the Funny Farm this week. I usually find time to write between disasters, but they are coming fast and furious, so this is a mid-disaster story whose end cannot yet be told. At the moment, The Bartender (my “significant other”) is stable, and so is The Mathematician (my son) so here is what is happening at the Funny Farm. Dressing in the dark and racing to the Emergency Room doesn’t leave much time for details. For un-matched shoes, I think I did pretty well. Dobby is enjoying our fabulous but uncharacteristically balmy weather. Swimming season has arrived! It’s actually pretty cold outside if your swimming pool water is 49f (9c) degrees. Dobby spends a lot of time inside, napping. I have tried to get a video of his snoring, but he is too wary and always wakes as I sneak up on him. We still spend most afternoons in the garden. Dobby grazes in the front yard, the poultry plays in the back. Lula the hen is on Metacam for her mysterious ailment, and she has even made it out to the back yard a few times lately. 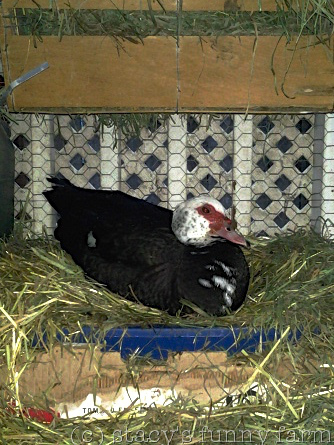 Carmen Miranda, our newest duck, has proved to be very self assured. She is trying to claim the rabbit litter-box as a nest. Whatever. Carmen, get out of there! In spite of everything, we have managed to make some improvements to the Funny Farm. We now have five birds in the kitchen: two doves, one parakeet, and two cockatiels. 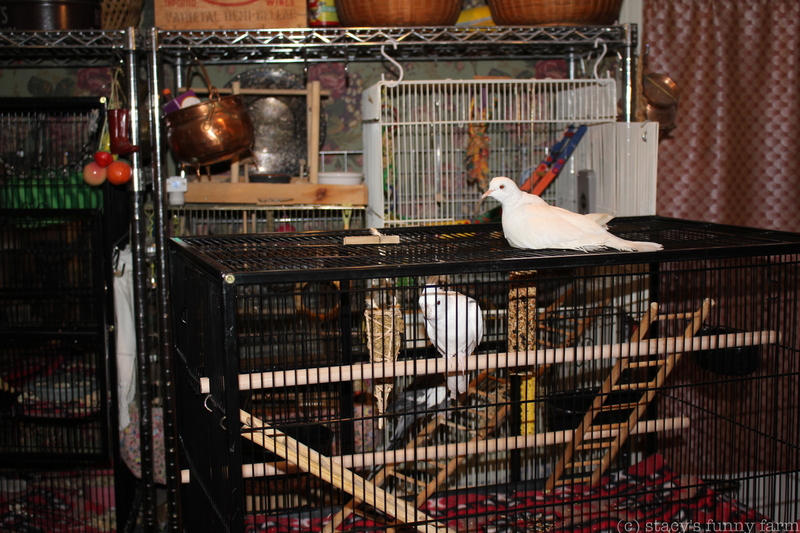 Our first goal was to acquaint the two doves and move them from two smaller guinea pig cages into one large bird cage. 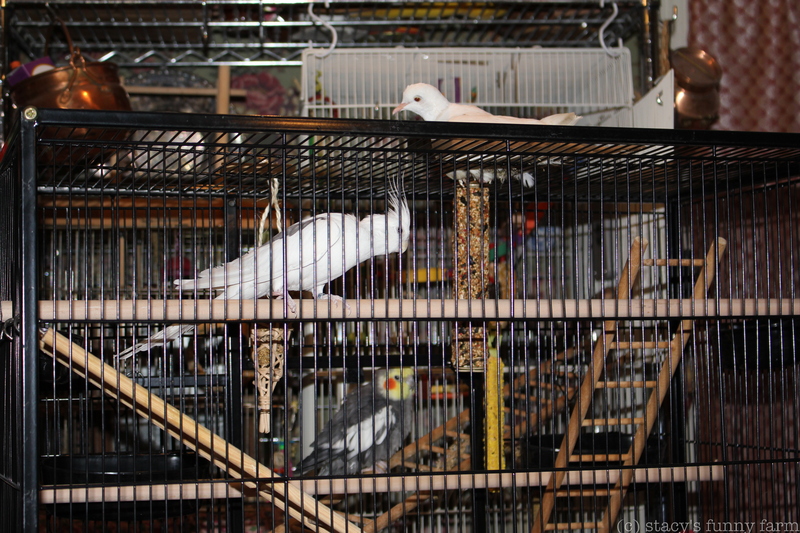 The Pirate cannot walk, and Luna Dovegood cannot fly, so the cage was equipped with landing hammocks and ramps to allow them to use as much of the vertical space as possible. So far, so good. 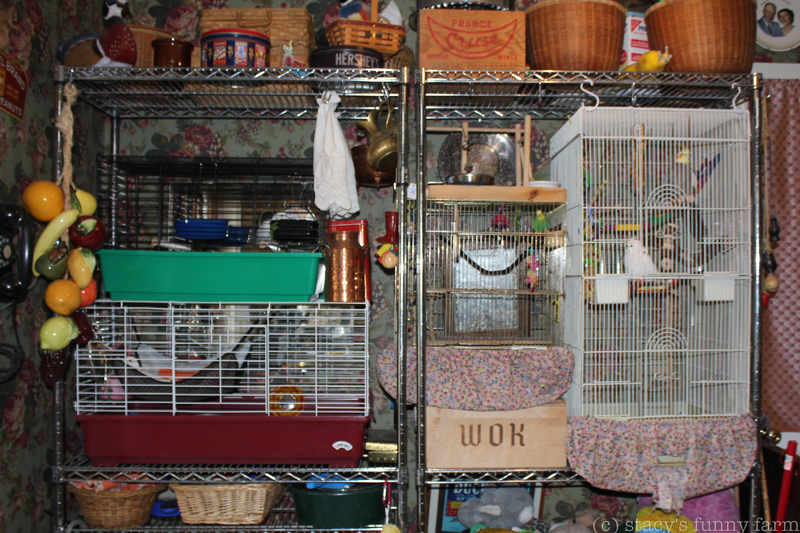 Doves are on the left in the new cage. The next step was to move two elderly cockatiels and the bullying parakeet into the other cage. I put a horizontal divider in the cage. 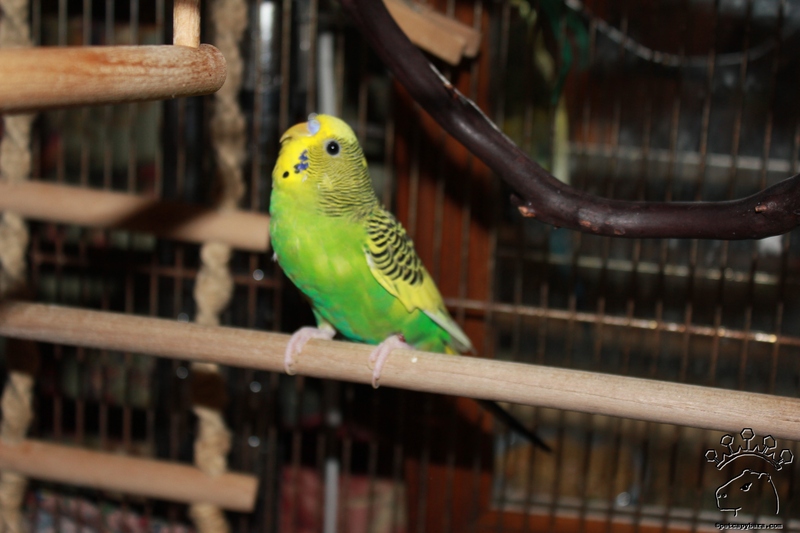 Spike the Budgie is far too aggressive to share space with the older gentlemen. Plus, he doesn’t need the encouragement of being “Top Bird” so little Spikey gets the first floor apartment. Vincent the cockatiel explores the new cage. 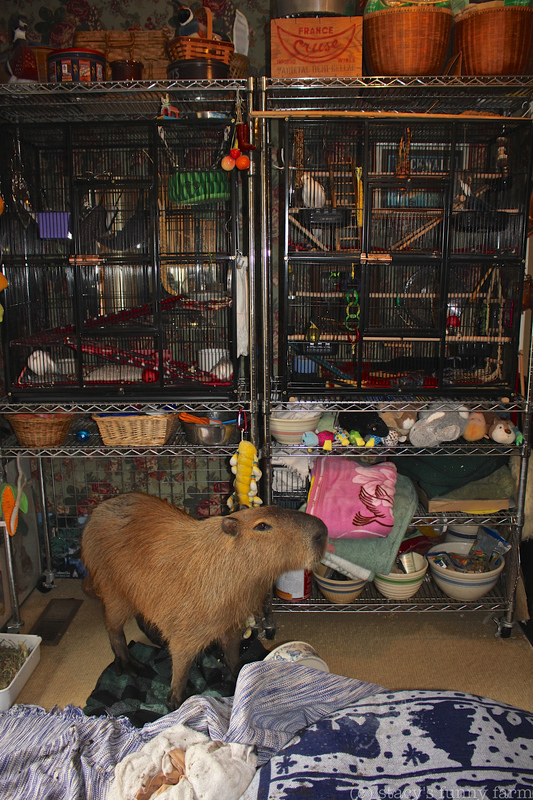 Every evening for a week, I rolled the new cage into the kitchen for playtime. 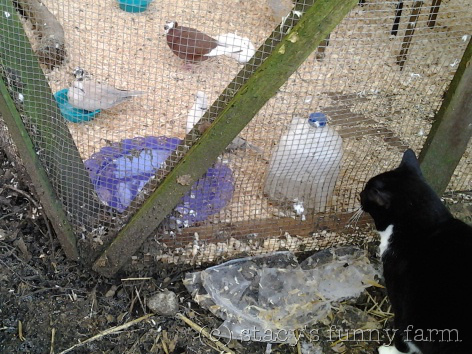 I coaxed the birds into their new spaces with treats, and they began to enjoy the new play area. The Pirate thought she was very clever to perch on top. Luna can’t fly, and now that she has been here a while, we know why. She has an inoperable tumor on her left wing. It has grown very large, and she is now on Metacam. 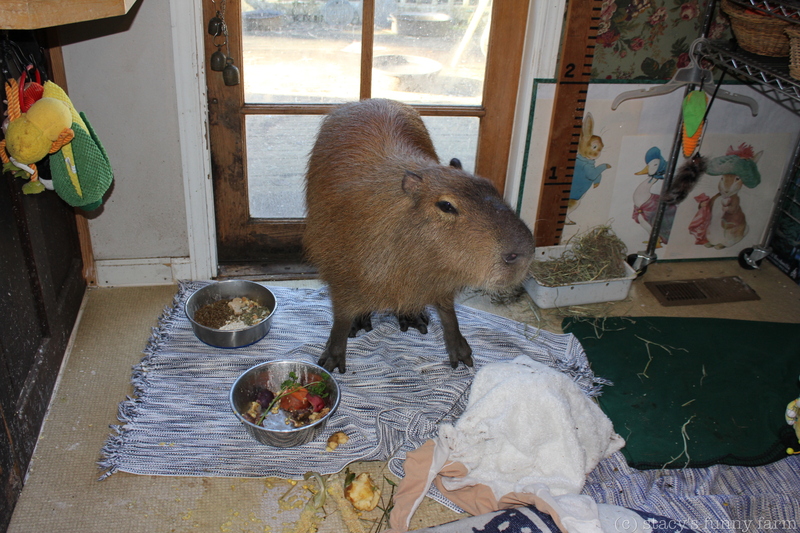 Her appetite is good, she moves around her new cage by walking on the ramps, and since starting the medication, she has been cooing a little bit, again. The tumor is really quite serious. It is on the other side and you don’t want to see it. 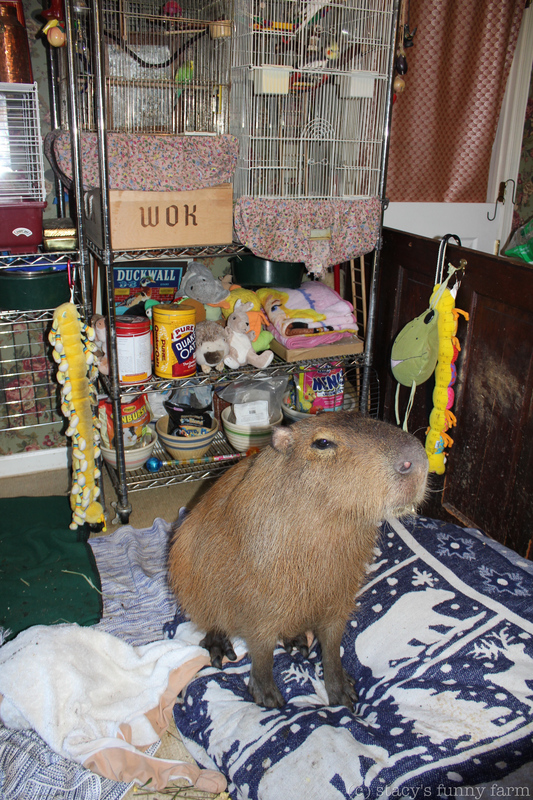 Jorge finally checks out the new cage. Like the dove cage, this one also has a mattress-like floor to accommodate unexpected plummeting. Instead of ramps, it has ladders so that Jorge can get back up to his perch. Vincent is about 14 years old, but still gets around just fine and has been very comforting to Jorge, who is one of those bird-birds, not a people-bird. Or maybe Jorge was traumatized at some point. I will never know. Happily ever after, they are all in their new, improved cages. 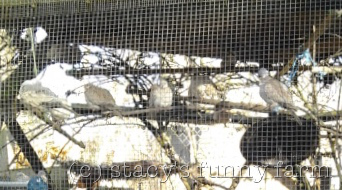 I still have to hang a curtain between Spike the budgie and the doves, though. He is such a pill. It is egg-laying season, so I am constantly raiding nests. The last thing I need is more poultry to care for. I shipped off the first goose eggs, but I have decided to keep the rest and blow them out. They are really very cool. One of my biggest distractions right now is my Mom’s diary. She was 13 years old when she started writing in it in 1940. It goes through 1944, and her personal story is so well told that I would like to share it. I have transcribed it and I am adding photos, a World War Two timeline, and a few footnotes where clarification is helpful. 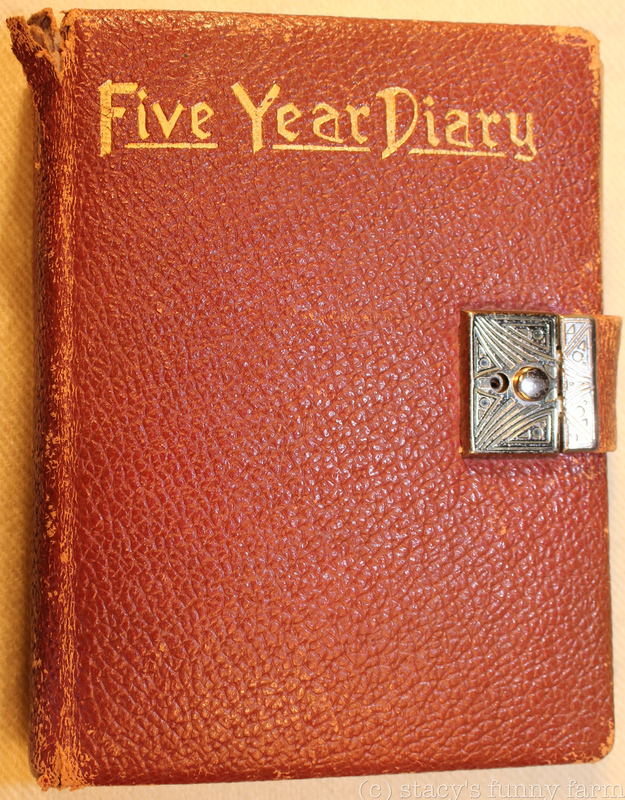 Seventy years later, I am discovering artifacts mentioned in the diary. Most of them were gifts from her boyfriend, Andy. She kept them for fifty years and I have had them twenty. 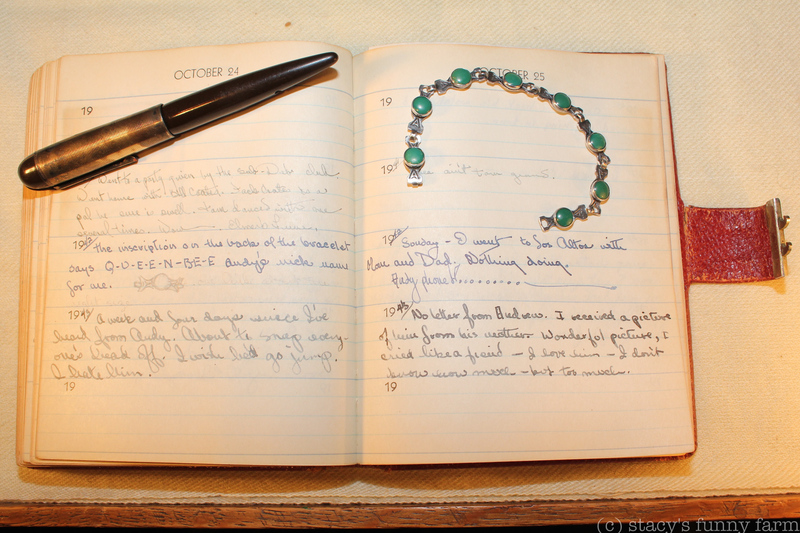 It is my mother’s diary, but it is about Andy, and I am certain she would want his memory kept alive in this way. Dobby isn’t certain he approves of he new cages. 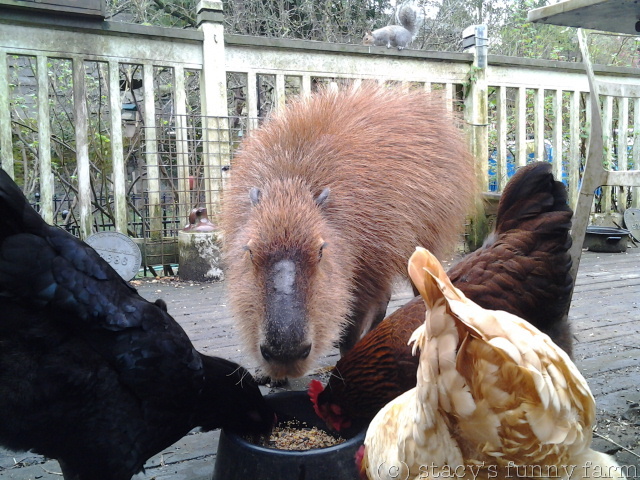 My drakes are fighting, my capybara is amorous, the turtles are out of hibernation and basking, and the wild birds are flying around with beaks full of twigs. It must be spring! The duck pool keeps freezing. I use hot water to melt the edge for them. We skipped autumn and careened directly into winter, starting with a deep freeze in October followed by another in early November. Now that it is actually winter, we are freezing again, down to 22ºf (-5ºc) again last night. This is supposed to be a mild climate. In previous years, temperatures might dip down to 26ºf for a night or two, once a year. This year, we have gone into the lower twenties, three times already, for four or five nights in a row. And yet, it was one of the warmest Decembers recorded. We just set a new record for high pressure. Extremes are now the norm. Dr. Pepper, is that you in there? This is the third time the turtle tank has frozen. I always glance in there, anyway, and today I was shocked to see someone looking back at me! It could be Quasimodo. Hard to tell through an inch of ice. It is hard to keep duck water clean, and valved waterers clog easily (and then run) when ducks load them up with rocks and gravel, not to mention mud. I find it is easier to leave a hose on trickle and the water self-cleans. Not the most efficient system, but it also keeps the system from freezing, down to about 20ºf. Below that and the ducks have to worry a little drinking hole open. I have seen them take turns keeping it open. 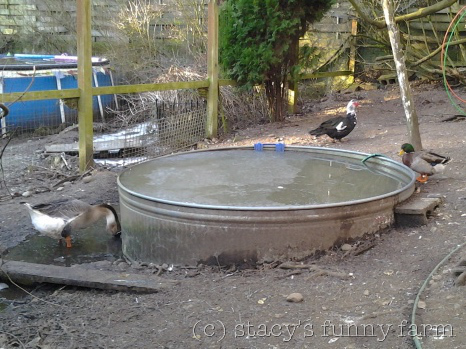 The big duck pool also has a hose dripping into it, and in that duck pool photo, Norman is standing at the overflow. And such an attractive setup, too! 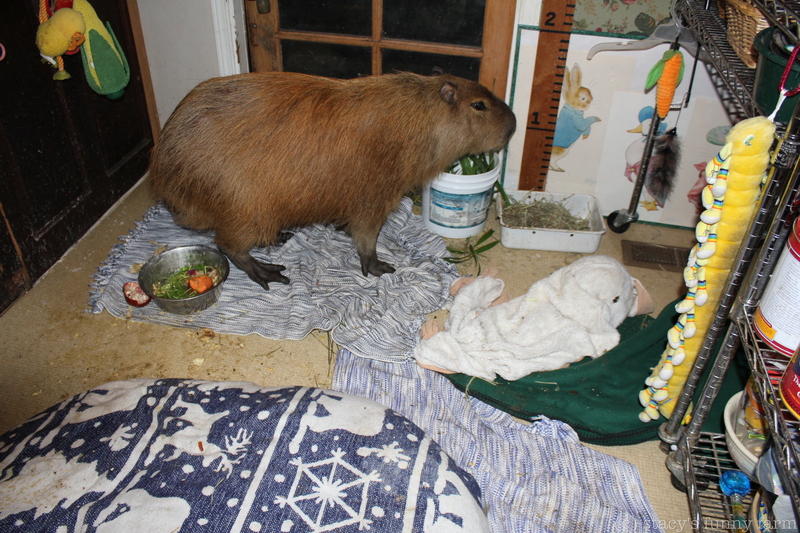 Note the black corrugated capybara protection device over one of the live lines. The cats love their barn and heated kennel pads. Hawk is always under foot, but Grover is getting more friendly, now. He has initiated a Good Morning Nose-Bump with me. He is incredibly shy. Get out of the way, Kitty Hawk! I take warm water out to the dove cage, fill a couple bowls (their waterer is frozen out of commission), dump the shallow purple bath and fill it. I’ve seen a half dozen of them in there at once, but not when I have my camera out. 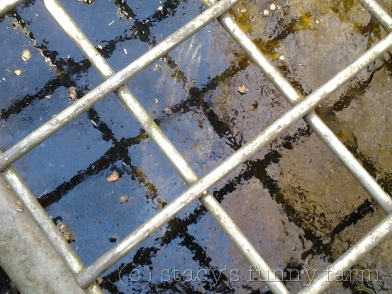 You can see the previous days’ frozen water outside the cage. Stashing the frozen bits where they don’t impeded access, create a hazard for duck feet, and melt quickly takes experience. I have a hen and dove sharing an infirmary cage, and today, Kitty Hawk leapt over my shoulder to gain access while I was cleaning their water. He has been especially crazy lately. He likes me to take him for a little walk, and I have to hold his tail like a leash. Doves looking down at Kitty Hawk. It wasn’t easy to get Dobby to the front yard today. Look at that frost! It is like snow! Yesterday’s corn cob is frosty, too. Dobby is eager to return to the back yard. I wonder why. 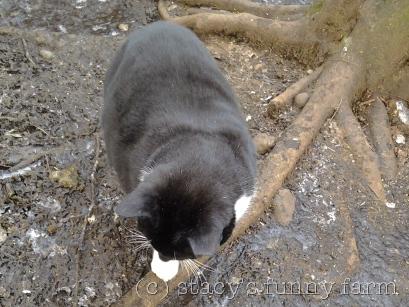 Wiley Wabbit has declined to attend the Garden Party this afternoon. 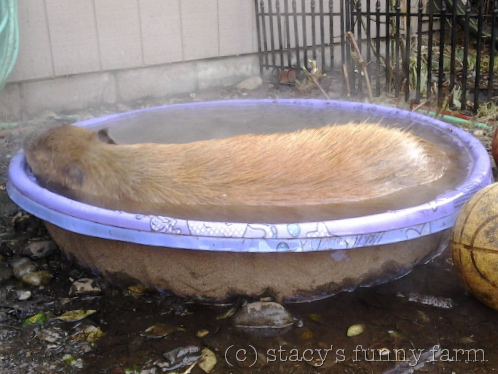 Dobby has been spending a lot of time in his fancy hot tub. I have a hot water tap and hose right next to it. 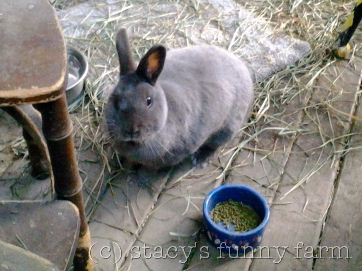 Bonnie Bunny prefers cold weather to wet weather and is taking advantage of the situation. This little garden area is Bonnie’s favorite. 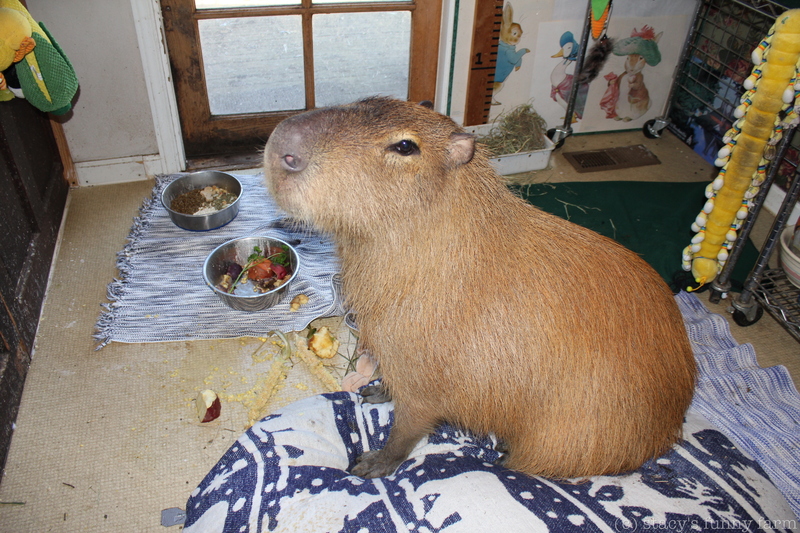 The gate in the foreground is meant to keep Large Rodents out, but it barely slows him down. 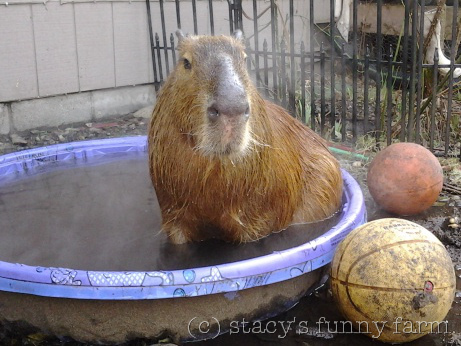 Meanwhile, the Large Rodent is steaming. All of the pets are wary of Dobby. When temperatures drop to the low 20’s, Dobby gets to sleep indoors. He used to hate it, but this is his 5th winter and he is more experienced. I truly think he understands about the seasons, and knows his frozen world is transitory. Apparently, only the back 1/3 of him enjoyed the hot tub today. It doesn’t look too bad in this photo, but his area gets pretty grubby when we can’t get in there to mop and wash the bedding every night. Corn on the cob makes a sticky mess, and the kernels stick to your feet and end up all over the house. 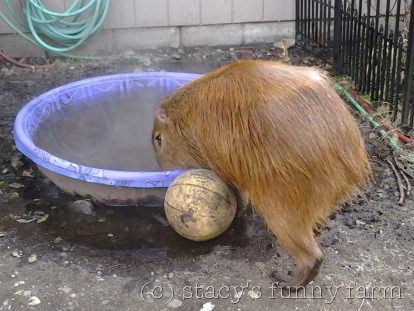 The guinea pigs don’t know winter. They do know vegetables. Dobby used to wander in and out all night when I tried to keep him in. He would drag out a blanket and the door would stand open, letting Alaska inside to chill the birds. I put a heater in there, now, and he also doesn’t wander out so often. 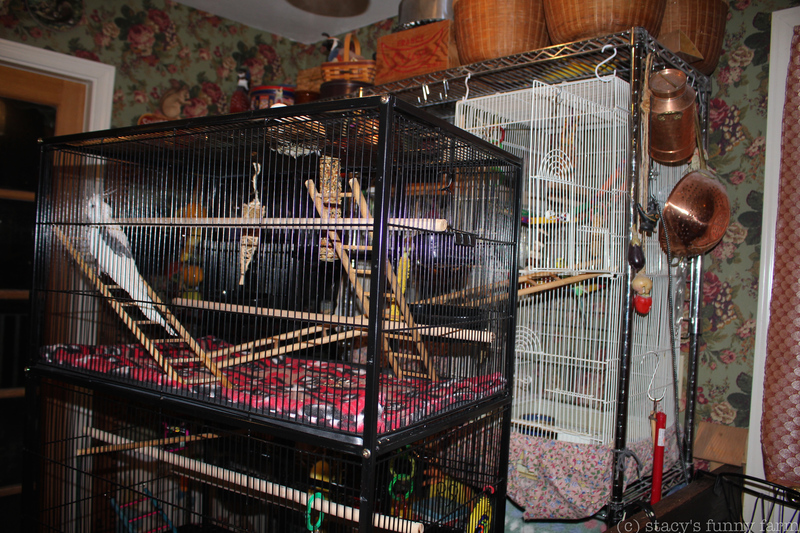 I cover the birdcages with an insulated curtain. Dobby thinks the curtain is a chew toy, just like the cage ruffles he has taste tested. Most of the time, I remember to bring in the hummingbird feeders. Am I the only one who wakes up at 4am, remembers the hummingbirds, and sneaks outside in my pajamas to bring in the feeders to thaw? And then wakes up again at 7am to take them back out? 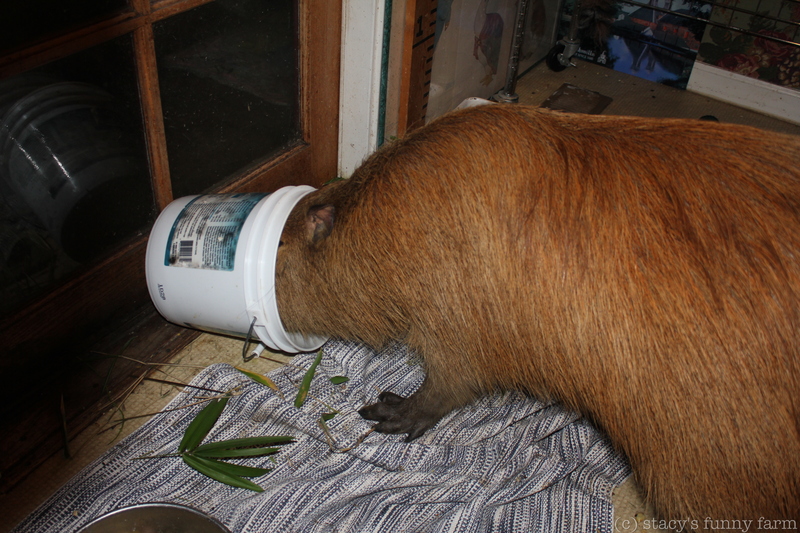 Bucket of bamboo, this time. Sometimes it is a head of romaine lettuce. Might be an apple hidden at the bottom. Go for it, Dobby! It’s going to be a long, messy night!